We make the customer the priority in everything we do and it makes a huge difference in the customer experience. We respect our clients, their property and their time. When Tony Holt decided he wanted to leave corporate America and own his own business, he also knew he wanted to serve the community and help make people’s live easier. That’s what he’s looking forward to doing with his new business, House Doctors of East Alabama. House Doctors of East Alabama offers professional handyman services in Auburn, Opelika and Montgomery in Alabama as well as Columbus in Georgia and the surrounding communities. The team at House Doctors is focused on professionalism, service excellence and quality workmanship. Their goal is to make home improvements easier for their customers by being on time, doing the job right and offering a one-year workmanship guarantee. “I know from personal experience and in talking to friends and family that finding a professional company for smaller jobs can be challenging. I’m looking forward to filling that niche with House Doctors. We can do larger projects too, but our specialty is work that takes two hours to two days to complete,” Holt said. House Doctors’ experienced, insured, background-checked and uniformed handymen technicians specialize in projects that take two hours to two days to complete, such as light remodeling and repairs of decks, doors, bathrooms and kitchens; repairing drywall; painting; exterior repairs; making home modifications and much more. Prior to opening House Doctors, Holt spent 13 years in corporate America as the a district manager of a book store for Books a Million and then a regional manager with Follett Higher Education Group. Before that he owned a chemical lawn care company. Holt says House Doctors is about more than just the quality work – it’s also about the customer experience. 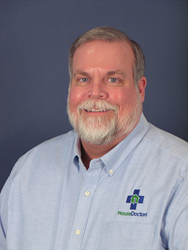 “When I learned about House Doctors, I was impressed with the emphasis the company places on professionalism and customer service. We make the customer the priority in everything we do and it makes a huge difference in the customer experience. We respect our clients, their property and their time,” Holt said. To learn more about House Doctors of East Alabama, call (334)742-9607, email HD548@HouseDoctors.com or visit https://housedoctors.com/handyman-eastalabama/. House Doctors Handyman Service has been helping homeowners across the United States with home repair and light remodeling projects for more than 20 years. Our friendly, insured and bonded craftsmen are scheduled to be there on time and are committed to complete customer satisfaction. Each of our technicians are experienced in home maintenance, product installations and a variety of home improvements. We’re so confident in our team and products that every job we perform comes with a one-year guarantee.